The typical essay grader spends anywhere from 30 seconds to a couple of minutes to assign a grade to an essay. So, it is absolutely vital to make that “first impression”. If you haven’t exercised your writing muscles for a while, it is a good idea to put in some practice. Scoring well on the AWA is not an esoteric art, you just need to keep few basic things in mind. First and foremost, structure your essay by having a clear division of paragraphs: an introduction with a clear thesis, 2-4 body paragraphs, and a well-rounded conclusion. Clearly state in the introduction the position you are taking and be careful to not include any new ideas in the conclusion. Use plenty of transition words: phrases such as “however”, “consequently”, “moreover”, “on the other hand”, “specifically”, “undoubtedly” et al help a lot in guiding the reviewer towards the basic structure of the essay, and especially useful in the case of a time crunch when all the major ideas expressed need to be read once. Here is a list of transition words you can use to lend some charm to your essay. Use sample templates: they will guide you in the best possible way to format your essays. You should attack the essay with a certain template that you have already perfected beforehand. It takes away a lot of stress as you just need to structure the essay around the template after the initial brainstorming. Use the initial 5 minutes to outline before starting with the actual essay. Download this GMAT essay template by chineseburned (an author on GMAT Club) –> link. Look for the flaws: in the essays which need to be critically analyzed, look for flaws in the arguments presented to construct the core of the essay. Most common flaws include sampling assumption, bad analogy, correlation/causation fallacy, ad hominem, non sequitur etc. 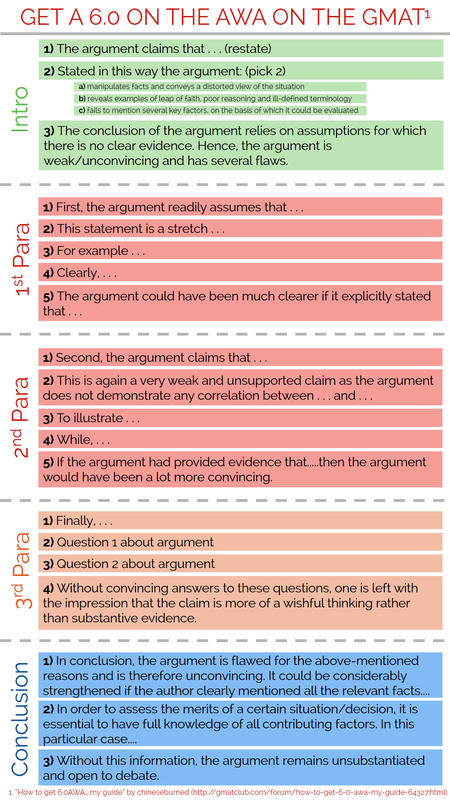 Here is a list of the most common logical fallacies. Remember the e-rater: have your priorities set keeping in mind the algorithm. Do focus on the grammar as it indirectly signals that you are smart — the ideas and reasoning are assumed to be better as a side-effect. On top of that, focus on the length of the essay, 500-600 words with strong grammar is the right mix of quantity and quality. Avoid using words you don’t completely understand as using big words just for the sake of it can seriously backfire. Skip originality: this section is not the right arena to express your creativity in unique ways. The electronic grader is not programmed to catch subtle humor or your poetic individuality. It is a section in which it pays to be boring and predictable. It is called “analytical” writing for a reason — flowery or opinionated prose is the last thing that the reviewer expects. Leave time to proofread: though the reviewers are not expecting a well-polished essay, significant errors or mistakes can diminish the readability of the essay and hurt your score. Hence, leave aside more than a couple of minutes to spell check and rearrange any sentences (if required). Start negative: while ‘be positive’ is usually hailed as the mantra for living a good life, it should not be your mantra while writing the essay. Our brains are hardwired for looking at deficiencies and missing pieces. Utilize it to the full extent and look for assumptions that are invalid or any flawed reasoning. Go with the flow: once you have made a solid outline, make sure that you complete the whole essay in a long stretch instead of revisiting the essay mid-way for correcting mistakes or ensuring perfection. You’ll iron out the issues in the second pass while proofreading, so don’t worry. Be a typing ninja: considering that you need at least 5 minutes in the starting for the initial outline and brainstorming and a few minutes in the end for proofreading, you need to type around 600 words in a span of 20 minutes. Considering the fact that you also need to think while writing at that speed, it is absolutely important to have a good typing speed. Resources like Keybr and TypingWeb are excellent resources to help you learn typing fast. It is a skill that should pay dividends in the future too! Not outlining: some smart guns believe that outlining the essay is a waste of time and jump on writing the essay as soon as they read the prompt. It can very soon descend into a mound of chaos, and with no outline to fall back on, you might end up erasing large parts of the essay half way in. It won’t be a pretty situation. Writing a bland essay: though it is good to stick to the proven path when it comes to the AWA, the reasoning and examples you give should be unique. If possible, try to even cite instances from your personal life to give a personal touch to the essay. The grader reads hundreds of essays in a day and a hint of freshness instantly makes the essay stand out in a positive way. Mixing up ideas: clarity and organization is of utmost importance when it comes to the AWA. Writing mixed up paragraphs with multiple ideas and no effective transition is a recipe for a low score. You should focus on a single clear idea in a paragraph and drive it home. Self-contradiction: while your arguments may be top-notch in isolation, they may not amount for much if they contradict each other in the bigger scheme of things. Hence, make sure that you have a coherent theme when drafting the outline for an essay. Writing long/convoluted sentences: simpler sentences are easier to follow. Make it so easy that a 10th grade student can understand it in one go. Here is an excellent article that explains how Flesch-Kincaid score (F-K) can improve your writing. Not concluding the essay effectively: summarize the essay by restating the major ideas presented, and wrapping up the overall big-picture narrative. It will help solidify the essay and tie up any loose ends. Make sure that you do not introduce any new ideas in the conclusion. Being under-confident: many writers have a habit of using phrases such as “in my opinion”, “in my view” etc. While it may be a figure of speech in a verbal conversation, it has no place in an analytical essay. We know it is your opinion because you are writing it, get to the point already! To view the sample essay responses and commentary for GRE, click here, and here. To view a sample essay for GMAT, click here. The actual historical GMAT essay prompts are also useful. Ready to try your newly gained skills? Use our AWA essay grader and find out. I am from India. I have completed my Btech in Engg background (Mech) and currently have 4 years of IT work experience in a reputed consultancy firm. I am more inclined towards the job positions which require my business skills for which I am planning to take GMAT by the mid of next year. What is my scope of getting admissions into good colleges and how much score is required (average) for good Indian/international B-schools? I am a civil engineer and have four years of work experience in energy sector. My score is 750. I am working for Indian Oil and have recently got a diploma in industrial safety (this counts as a part of 4 yr work experience as it was an on job training). I am planning to join a b-school next fall. My undergrad gpa is not that great (we had percentage system, so it is in sixties). What are my chances? Any guidance from your side would be of great help. After 5 year experience as IAS officer in INDIA what is my chance to get in Harvard business school ? i have not good percentage in my b.tech because of UPSC PREP. HBX core help me to secure admission at HBS. and how much GMAT score i need? I scored 660 in my GMAT1 Q(50)v(28). I have a work experience of 2 years as a software developer and a fellowship of 6 months in Germany. With this score can I try for any good college in India? Hi Sameer, I have done my B.Tech in Mechanical Engg but I want to shift to financial sector. Although I scored low in my graduation I have a good score in my IELTS and also have okay ish work experience. So could you plz guide me on my plan of action for finance? Thanks in advance. @Himanshu: I believe MG from our team is in discussion with you over email. So skipping it here. @Salil: IT applicants who’ve shared their stories on our site have typically have more experience and higher GMAT scores. It’ll be good for you to work on both before applying. @Pavan: You basically have two options to consider, if you’ve made up your mind to go for a masters. One would be the (relative generic) MBA and the other is a more specialised masters (MFin, MFE etc). Decide first which one you’d like to take up. The requirements and procedure for the admissions process will become clearer after that.